Haughton Green, with its wealth of history, has much to offer residents and visitors alike. 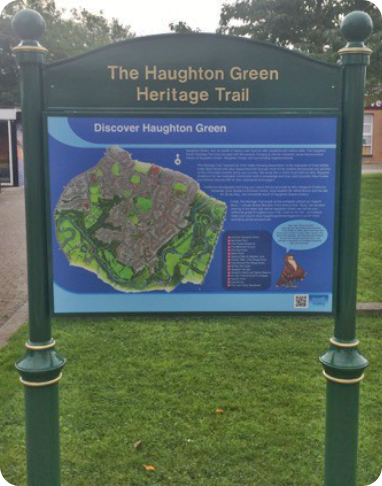 Approximately a two mile journey along highways, lanes and woodland, The Haughton Green Heritage Trail links the past with the present, bringing to life the industrial, social and cultural tapestry of Haughton Green, Haughton Village and surrounding neighbourhoods. The Heritage Trail, financed by Irwell Valley Housing Association, is the inspiration of local wildlife writer Sean Wood who also researched and sourced much of the content and pictures you will find on the information boards along your journey. We would like to thank local historian Mrs. Margaret Smethurst for her invaluable contribution both in knowledge and time, and Councillor Mike Fowler and Andrew Gwynne MP for their assistance and support. Additional photographs that bring your Trail to life are provided by Mrs. Margaret Smethurst, Tameside Local Studies & Archive Centre, local resident Mr. Alfred Brown and the late Mr. Burley Key, who chronicled much of Haughton Green’s history. The Heritage Trail would not be complete without ‘Buzz’ – a Buteo Buteo Buzzard. From time to time, ‘Buzz’ can be seen soaring in the skies high above Haughton Green and will be your additional guide throughout your journey. Children, look out for him when you’re out and about and take part in the Buzz quiz!